Is Bad Service Your Fault? Back in January I wrote a post about being a better customer to get better service. A recent experience makes me think this might need to go a step further. Linda and I were out and about again, and we stopped into one of our favorite deli/salad bars for a light dinner. We knew there was a special terminal where you could just order the salad bar and skip the rest of the sandwich line, so we stepped up to the unmanned terminal and we waited. After about 30-40 seconds of misguided waiting, a managerial-type walked over and asked if he could help. He was VERY nice, patient, and explained the process well. From a service standpoint, he did well, but it was the new process that dominated our dinner conversation. From a business standpoint, I can see why they did this. Less labor equals higher profits, or at least flat profits as other costs go up. However, as a consumer, is it fair for us to pay the same amount for a salad as we did before, considering we are now doing a large portion of the “service-related” work. Hmmm. Of course we see this all over the place. The airport has self-service check-in, Lowe’s and Home Depot (and many others) have self check-out, and it seems more and more that the service we are getting… is from US! This really got us thinking about the VALUE we place on service (as consumers and as businesses), because that is really the missing link here. Previously, if a salad was $7.99, we knew part of that money was going to pay the person who took our order. Now that person (and their service) is gone – so what are we paying for? As an organization, while this practice might help to show a healthier bottom line, does it de-value the need for actual human beings to serve your customers? Do we now simply look at positions on the line schedule as a dollar sign, rather than an opportunity to differentiate your business from the rest. I look at an organization like Men’s Wearhouse. You are greeted and taken care of by someone who gets to know your needs and recommends things that actually go together (a challenge for most guys). The price is a little higher, but you know that when you walk out of there you will have a jacket, a tie and pants that all match! What is the value that YOUR employees provide to your guest’s experience? Notice I said ‘guest’ this time instead of customer. A customer is someone who buys stuff, a guest is someone we welcome in and take care of. Even changing that mindset can have a big impact on the decisions you make when it comes to cutting or eliminating service positions in the name of profits. 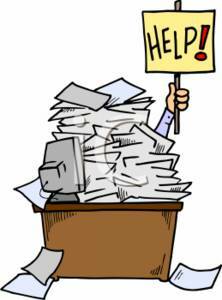 So be careful in cutting too many staff positions and replacing them with technology. It might seem like a good idea because good people are hard to find and you can provide a consistent experience with a computer. But if that experience is consistently bad, your profits will suffer even more. 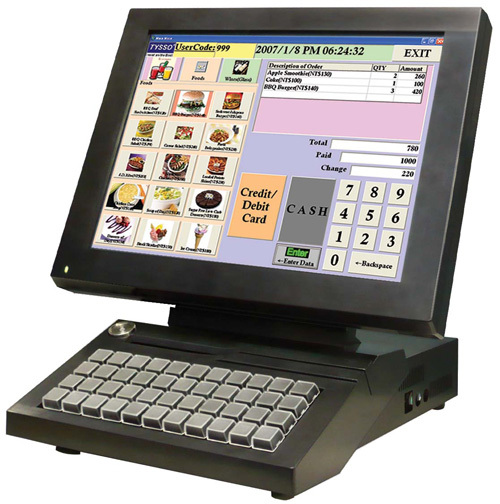 A few days ago, Linda and I were doing some research on one of those fancy receipt scanners – the ones that scan and read your document, then file them in the appropriate place on your computer. Brilliant! Saves time, space and paper. We weren’t getting very far with our online research, so we decided to get out, get some fresh air, and ask the helpful folks at a couple of the local office/small appliance stores for some help. Empty-handed we trucked on over to an office store – surely they would know how to help us. Sadly, no. I will say that one of the employees was helpful in that he knew more than most, and in fact he knew enough to tell us that the software for the scanner is not yet compatible with Windows 7. We’re not running Windows 7, but I appreciate the insight. Tweedle Dumb’s advice (employee #2) was a little less helpful. When asked if two similar machines from the same manufacturer used the same software, he couldn’t tell me. “Now you are getting too technical. I’ve never used these. If I had one of my own I could tell you more. You’re probably best off looking at the reviews online and calling the company.” Once again empty-handed, we left. Third time has to be a charm, right? Think again. While Junior at the big box electronics store didn’t have any information, I could at least understand why – because they didn’t carry that product. Also to his credit, we found him half-way across the store from where we needed to be and he happily walked us over to the software area and helped us look. Again, we left empty-handed. Where I think our sales/service experience suffered was from the low, low, low pressure sales approach. I will be the first to admit that I appreciate being left alone for the most part in a retail store, however when I do ask a question, I (and I think most consumers) expect some answers – even if it is not to the question we originally asked. Each one of these folks had the opportunity to ask us some questions about what we were looking to do, why we needed the scanner and our understanding of other products. I’m not a salesperson, but that seems like sales 101. Get to know your customer’s needs so you can meet it. But maybe that’s the problem… the individuals we met that day are not sales people either. They are associates, or team members, or crew members, or employees, and the expectations are much different. As we shrink our staff and combine positions to save money, we also place less emphasis on being a specialist. A specialist would know every piece of equipment in that store whether they personally owned it or not. It would be a requirement to test things out, find the bugs, understand the ins and outs so you could explain it all to your customers. I guess what really surprised me was the lack of, “You know, we don’t have that, but let me see if we do have something that would work”, which probably stems from a lack of knowledge of products in the store or in the market in general. A few rounds of at least looking for an alternate solution would have helped our experience tremendously. Then at least we would have had some information, even if we were still empty-handed. I was standing at the register completing a very pleasant transaction when the phone rings. (Now, don’t get me started about answering the phone and giving priority to someone who pushed a few buttons over the person who actually came into the store… deep breath…more on this later*). I could take that, I guess because it happens so often. What amazed me was the speed at which the employee rattled off whatever mandatory “thanks-for-calling-whoever-we-do-something-better-than-someone-and-we-have-a-special-offer-on-something-my-name-is-something-how-can-I-help-you?” spiel. I’m exhausted just thinking about it! It reminded me of the old FedEx commercials. How many times have we probably called a business, gotten a speed-talker and wondered if we dialed correctly? Mandatory phrases like this usually end up creating the exact opposite effect than intended. The caller didn’t hear something special about your company that made them glad they called, and they certainly didn’t catch the clever brand reinforcement you scripted. Instead, they heard the jumbled, turbo charged monologue from someone who probably didn’t want to say all that in the first place, and worse, probably doesn’t even believe it. If I had the power to start the “less is more” phone greeting revolution, I would start by canning all the canned greetings that people are forced to say. I would give the people who answer the phones the ability to greet their guests in a way that makes sense to them, but is still appropriate for the business. Next, I’d take out all the fluff about deals and services and how great you are. When people call, they want to know that they called the right place and who they are talking to. I say give them that information and no more. Remember, you can’t provide a service to the guest if you never give them a chance to tell you what you can do for them. “Thanks for calling Big Al’s Amusement Pier, this is Matt. How can I help you? Just enough “ramp up” time to get used to your voice and it includes the information they want. Now spend time practicing the phrase s-l-o-w-l-y, while enunciating every syllable. Doing that, rather than working to memorize some random corporate tongue-twister, will undoubtedly cut down on the times you hear, “Who is this? Who’d I just call?” THAT”S not good for business. PS – *to finish my “he took the call in front of me” story… as he was on the phone, the credit card transaction completed and the receipt printed. He handed it to me while continuing his conversation with the person on the phone. Silently I took the receipt and my purchases and headed for the door. 10 steps later I hear, “Thank you, sir! Have a great day!” I turned around and sure enough, he was talking to me. A little too little, a little too late. Reading recommendation from a reader! A friend and former colleague at Valleyfair, Lacey Lange recently sent me a note with some recommended reading. Now in Marketing and Communications at Cloverdale Foods, Lacey shares her perspective of a recent literary find. Here is what she had to say (reprinted with permission). 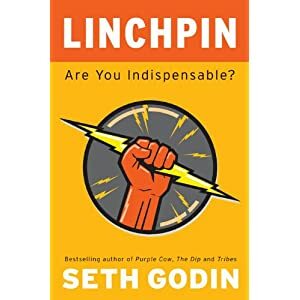 “I wanted to ask you if you’ve read the book “Linchpin: Are you Indispensible” by Seth Godin? I’ve shared this book with numerous colleagues, my intern and a couple of friends – as a gift at first – and it soon developed into a sharing of sorts. The book really grabbed me and if anything – gave me a definition for myself…A realization that this was the way I felt, sort of an AHA moment. It inspired me to talk to the President of our company about the Leadership training that we had been told was mandatory to attend. What I had come to believe, was that they were providing this training as a sort of gift. If we want to become better employees…people…etc. than we could take the lessons of the training and use them. I was right. He agreed with what I had believed and deduced that it’s just like church. Thanks for sharing, Lacey! I agree that any type of training, development, feedback or coaching is like a gift… and we know that some are more open to receiving the gifts than others! The other interesting thing is that this book inspired a “definition for myself” for Lacey. Ultimately, it’s people who make a team or company successful. When those people are true to themselves, in the right roles and firing on all cylinders, most measurable components of business (profits, sales, productivity, efficiency) increase (making the 100 by 100 an attainable goal!). If anyone else has read this book or others you would like to share, email me here and we’ll make it part of the discussion.